We manufacture our products using superior quality raw material in conformity with the industry laid standards. We are manufacturer of jute bags, cotton bags and non woven bags with customized design, size with your logo printing. We have eco friendly bags, promotional bags, shopping bags, Tote bags, drawstring bags, cheap bags, packing bags, ladies fancy bags, Hand bags, new designer bags and many more according to your requirement. Description : Beach bag made in canvas and handmade batik with pure leather trims.Roomy interiors lined in polyster can contain large beach towels, odds and ends. 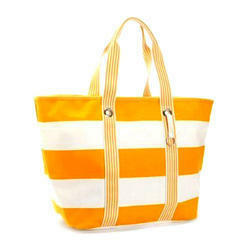 To match up the changing and growing needs of patrons, we are known for offering an extensive range of Canvas Beach Bag. For designing the offered bag, we make use of eco-friendly dyed jute fabric is used. Our ability to meet the bulk orders of the offered bags has helped us in attaining a commendable position in this domain. SIZE A :13' X 18" X 6"
SIZE B :11' X 17" X 6"
SIZE C :9" X 13' X 5"